Automated doors, an integrated rake without a separate engine, fully airconditioned, aerodynamic by design and capable of fast acceleration and quick braking, Train 18, was formally unveiled by the Railways on Oct 29, 2018 with many of the features of metro trains that we daily commute in. Train 18 was conceptualised, designed and manufactured in India by the Integral Coach Factory in Chennai. The rake that was unveiled on Monday has 16 chair car coaches. It took 18 months to develop. Executive class seats, the train’s transformer and braking system have been imported. Train 18 is designed to look like a Bullet Train but it won’t be nearly as fast. 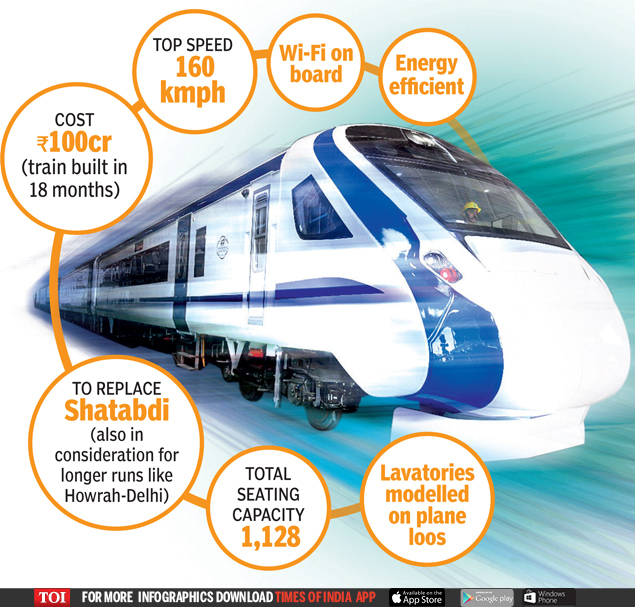 It will be tested for a top speed of 160kmph, though designed for 220kmph. That will make it India’s fastest, though on a par with Gatiman Express (whose official speed has now been reduced to 130kmph).